1Kerala Veterinary and Animal Sciences University, Pookode, Kerala, India. 2Safi Institute of Advanced Study, Malappuram, Kerala, India. *To whom correspondence should be addressed. E-mail: meghapu928@gmail.com. Received 18 September, 2017; Received in revised form 24 October, 2017; Accepted 30 October, 2017. Pogostemon quadrifolius, Antioxidant, Antiproliferative, MCF-7 cell line. 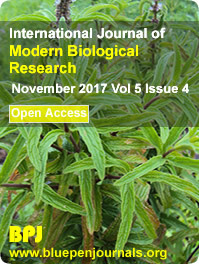 The aim of this study was to determine the antioxidant and antiproliferative activity of Pogostemon quadrifolius medicinal plant extract from Lamiaceae family. Crude leaf extracts, of methanol, ethyl acetate, aqueous and chloroform were evaluated for in vitro antioxidant activity using 2,2-diphenyl-2-picrylhydrazyl (DPPH) and reducing power assay. Antiproliferative activity of the plant extract was evaluated in breast cancer cell lines of MCF-7 using 3-[4, 5-dimethylthiazol-2-yl]-2,5-diphenyltetrazolium (MTT) assay. The investigation of antioxidant activity by reducing power assay showed that the methanolic extract had a higher activity followed by ethyl acetate, chloroform and aqueous extracts. Antioxidant assay for the different extracts by DPPH assay gave percentage levels of inhibition of various concentrations, among which ethyl acetate extract and methanol extract had relatively higher IC50 values of 88.5 and 80 µg/ml respectively, indicating relatively high antioxidant activity. The results of MTT assay revealed that methanol extract of P. quadrifolius is effective, with 50 µg/ml as minimal lethal dose in killing approximately 50% of cells. Planned future investigations should involve the purification, identification, determination of the mechanisms of action, and molecular assay of P. quadrifolius plant extracts.